Pink, the hallmark color of womanhood, spells “happy” and is also Spring’s favorite outfit for blooming trees, gardens and formal or informal flower arrangements everywhere around the earth. One of my favorites, the Leopard Orchid, fascinates me with its variations of color and pattern, as well its delicacy and finesse. Orchids generally by name inspire visions of wondrous beauty in jungles, a beauty unattainable by any but the wealthiest or the most adventurous. Yet the orchid, far from being rare, is numerous, varied and virtually ubiquitous. There are at least 25,000 species, growing in every continent and in nearly every climate. 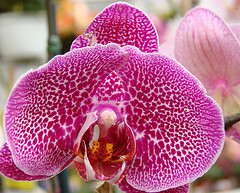 Despite their fragility, orchids are relatively long lived and easy to care for; they give an aura of exoticism, though they are easy to find and are not more expensive than other house plants. In interior design, we find Pink in sumptuous fabrics, painted furniture and accessories. We introduce pink any time we want to give a “candy” flavor to the room. On walls, pale pinks cast a soft rosy glow that reflects both artificial and natural light, and are ideal for flattering people and objects. In more formal settings, pink creates a delicate backdrop that brings out richness of dark wood furniture pieces. 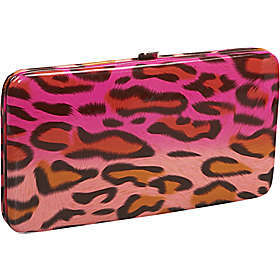 For the playful, artistic woman this Leopard wallet in ombre pink, is the best accessory ever owned. Cute and colorful, it will give you room for all your necessities.